Content marketing is a best practice for SEO. We all know that by now. You create content that answers users’ questions and is optimized for search. When Google, Bing or another search engine displays your content in results pages, you get more exposure and your web presence grows. What you might not know is that there are many ways to get additional value from your content besides organic search visibility (or paid, for that matter). We’re big proponents of distribution strategies, because in the current SEO and content marketing landscape, the “if you build it, they will come” promise just doesn’t hold up. The truth is: Unless you have a site that gets a lot of traffic regardless of blog content, you’re going to need to do some promotion to open the visitor floodgates. One of our business consultancy clients was in a situation like this. Our content writers were producing fresh posts for the company’s blog every week, and those articles were doing their job. 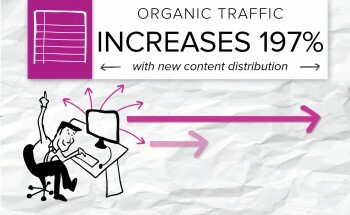 Organic traffic to the site was increasing at a steady rate. However, the client wanted to catalyze its results to reach the goals it set for the campaign sooner. Brafton’s content marketing strategists came up with a plan to distribute the articles across other channels. This would get the content in front of more audiences, and it would compound results coming from organic search. Our social media strategists started publishing social content about information from the latest blog posts, case studies and customer testimonials. Using brand content as inspiration for Tweets, we had multiple opportunities to wring additional value from the content that’s already been created, and push it in front of the brand’s audience. A social strategist might create three original Tweets from the information in a single post – and get even more Tweet-sized takeaways from an in-depth resource that’s chock full of data and quotes. In addition to the social distribution, we also rolled out regular email blasts to distribute the blog content to the company’s contact database. Each send might contain a roundup of the latest posts, include a series of articles all focused on the same topic or highlight one blog that provides a deeper answer to an in-demand question. Pushing content in front of the right audience was making a notable impact – more clicks, more visits. Pushing content in front of the right audience was making a notable impact – more clicks, more visits. However, it was having a wider influence on the site’s overall health. Because the articles were getting more engagement in general, they also started to get more organic search play. Google and other search engines interpret clicks, engagement and web chatter as positive signals about the content’s quality. As you probably know, the higher the content quality, the better the ranking and visibility. In creating a promotion strategy for the client’s blog content, we provided some immediate wins, but also generated momentum that will benefit the company’s overall search presence and have a long-lasting impact on overall visibility.